Look, everyone loves a tasty, high-quality meal. It’s always nice to head out for a fine steak and a glass of wine but sometimes the situation calls for a quick burger instead. PUGs, PVE questing and Battlegrounds are fine examples of this- certainly not steak time, but still no reason to go to battle hungry. But don’t go to the expense of burning your best food for PUGs, BGs or a few lowly mobs, save that stuff for raids and more difficult encounters. If all you want is to have a food buff (particularly the stamina component for use in battlegrounds) just purchase or cook up some of the cheaper versions of your favorite foods. Flexibility is key when finding ‘Cheap Eats’. Even if you’ve got your heart set on +Spell Power food, be willing to accept +Spirit, Crit or Haste instead. No matter what way you still get the Stamina buff and a little something extra to boost your other stats. Also, as long as we’re talking about flexibility, don’t forget to look in the AH for the uncooked version of the food you’re after as well. Keep in mind that a large part of keeping these foods cheap to craft is attaining spices as inexpensively as possible. While not all lower level foods will require the spices, it helps to constantly keep an eye on this item in the AH for deals. We find at least once a week some idiot will post a stack of Northern Spices for less than half the going rate. Even if we don’t need them at that particular moment we’ll scoop them up for later use or simply repost them higher. It’s easy money. Finally, the profit-minded WoW trader will be interested to learn that there is often a significant disparity between the prices of this lower-tier uncooked and cooked food. Look at this difference as an opportunity to conduct some profitable market corrections. Develop an understanding of both the base costs of preparing the cooked food and the timing of the sale cycle for the food and use this knowledge to exploit the market. Cuttlesteak– Many WoW fishermen pick up Cuttlefish while doing one of their daily fishing quests. Since the material is utterly useless beyond cooking into steak of feeding to hunter pets, it often gets dumped in the AH at near vendor sale prices. Baked Manta Ray– This one is great because it grants a buff that is beneficial to both casters and melee (haste) and does not require spices. Grilled Sculpin– Another one that requires no spices to craft. Nice boost to AP. Watch the market closely, however, as the fish required to craft the item are also a key component of Fish Feast so sometimes it is better to sell the raw fish than to cook into this item. Blackened Worg Steak– What’s that you say? The buff is useless? Not at all… pop one of these prior to your Wintergrasp farming runs and never be surprised by a gank-seeking enemy again. Of course, maybe you’re the ganker in which case this might prove even more useful for finding new targets. Pickled Fangtooth– The raw fish required to craft this item are often vastly oversupplied and extremely cheap on the AH. Pick them up and cook them up and keep your mana up. Again, no spices required at all. Snapper Extreme– Requires 3 raw fish AND spices but the fish are extremely oversupplied to such an extent that the crafting cost is often little more than the cost of the spices and your time invested. Worm Delight– Another ‘no spice’ recipe with a buff that can benefit all classes and builds (Crit). This one used to be more expensive until more players started regularly killing worms for the Sons of Hodir. These days a savvy trader can find the raw materials on the AH at a much lower cost fairly regularly. P.S. (free bonus tourist info): If you happen to be visiting the New York area sometime, be sure to check out Luger’s steak house (linked above). There are a lot of great joints in the city but this place is a bit out of the way so many tourists miss it. This New Yorker favorite has got a fantastic authentic Brooklyn atmosphere and serves up one of the finest steaks you’ll ever taste. Even the burgers here are great (and relatively cheap). This is not a paid advertisement, just us telling you where you can find a great meal during your visit. Not that we would complain if you invited us to come along for a bite mind you (hint, hint, nudge, nudge). We take a break from our regularly scheduled focus week posts to bring attention to a few issues that readers have pointed out to us or we have observed ourselves in the wake of the implementation of patch 3.2. Call them bugs or game design elements, either way they have the potential to alter your play or gold making styles. Have you observed any of the following during your sessions? Users of the unmodified auction house are reporting that the auction house page tabs (those small arrows on the top right section of the AH interface) are sometimes inactive (or grayed out) when they should otherwise be available. We have tested and observed this phenomenon ourselves. The issue occurs after having searched for an item and scrolled through multiple pages. On a subsequent search of a different item that does not have as many pages of inventory, the arrows are no longer usable. Worse, and more confusingly, we observed instances where, upon searching through multiple pages of an item, the subsequent search turned up the “No items found” message if the window was not closed and reopened or the user did not manually flip the inventory page back to page one. Simply close the AH interface after a search of an item in which you scrolled through multiple pages of inventory then reopen the window by talking to the AH NPC again to ‘refresh’ the interface. Note that, in most cases, your old search term will still be in the search text box so amend as appropriate. Some users and WoWenomics team members have reported having landing issues when attempting to land upon or near lootable nodes. The description most used is that of experiencing a ‘gliding’ effect when trying to land their flying mounts as though the player were expected to perform a deadstick landing. The issue seems to be particularly applicable to nodes on or very near steep terrain and appears to not be exclusive to only node farming but also other precarious landing situations. Give yourself a bit of landing room and attempt land just prior to the target location. If there is not sufficient ‘runway space’ fly just above the target and manually dismount so as to fall directly upon the target. It has been widely reported that some players are exploiting the newly extended honorable kill range in conjunction with the recently implemented honor bonus for node defense in applicable battlegrounds. The issue is that there are some locations, particularly the blacksmith location in Arathi Basin, from which a defender can be within range of every honorable kill on the map while at the same time benefiting from bonus honor awarded from being within range of the flag. Thus, certain players that do the least in the BG (and AFKers in particular) are now able to hide strategically and go make a sandwich and end up with more honor, and honorable kills, than active participants in the same battleground. There’s really no fix for this as this is the byproduct of recently implemented game mechanics and not necessarily a bug. That said, it is reasonable to expect that Blizzard will be examining the issue fairly soon and coming up with a fix. So, should you wish to benefit from this mechanic, now is an excellent time to work on HK location based and cumulative achievements bearing in mind that, in doing so, you are kind of taking advantage and perhaps even being a turd. On the other hand, some players may be inclined to actually learn how to defend and *gasp* call out the incs. One other interesting edition from 3.2 that may or may not affect your gameplay gold making is that Blizzard has implemented a “Not all of your mail could be delivered. Please delete some to make room” message for when your mailbox is full. It’s not a necessary change but is certainly helpful to those that may not have noticed missing mail or don’t otherwise have helpful mailbox add-ons enabled. Have you experienced these or similar bugs? Starting this week we are taking our weekly Funny Money column in a new direction. We will no longer adhere strictly to the format we’ve previously used and, instead, will bring you something we find humorous from either WoW or real world finance. We will occasionally revert to the old format, but this change gives us the flexibility to play with the column a bit and, we feel, better serve our readers. This week we’d like to tell you about herding morons. We recently read a piece from The Greedy Goblin about his frustrations with trying to get people to adhere to a cohesive strategy in the battlegrounds. Specifically, he points out his efforts in Alterac Valley. This struck a nerve with one of our team members who wanted to point out that, after much frustration trying to do the same, he finally figured out the perfect way to “herd morons”. All it takes is a little reverse psychology apparently. Now you’ve got a stratagy that everyone will follow! You should also note that the above fits perfectly within the macro character limit. Feel free to use it as you see fit. MMO Champion posted photos of the new quest rewards should you wish to research further. The irony in the change is that the lag was caused by massive player participation which indicated a large amount of interest in the content. It would seem that the content was too successful and now Blizzard is looking for ways to make it less attractive as opposed to either making alternative content more attractive or finding a way to reduce lag. 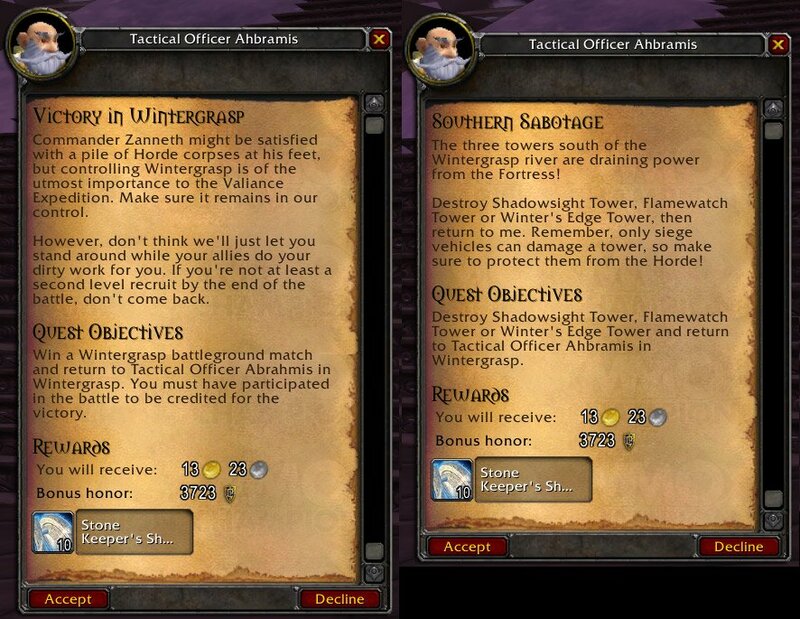 In decreasing the rewards for participating in a Wintergrasp battle Blizzard has also increased the opportunity cost of participation. It will be much more difficult to make the decision to join the battle going forward but this was, of course, Blizzard’s intent. For what it’s worth, Blizzard later stated that they’re still evaluating this change… And yeah, we won’t be holding our breath for a correction either.